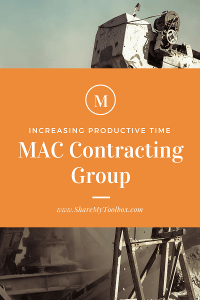 MAC Contracting Group is a small but growing contractor. To stay lean and profitable while growing, MAC has been strategically adding technology to keep the company efficient. MAC uses a tool management setup where tools are kept either onsite at a job in a conex box or in a central company tool trailer when not in use at jobs. Tool with a value of under $1,000 are usually purchased for each job foreman and stored onsite. Tools with a higher value are purchased at the company level and shared between jobs. Take responsibility for what was onsite. Have an easy way to search and find the shared tools as needed. ShareMyToolbox met these needs by enforcing a new policy where each foreman would “accept” each tool assigned at the beginning of a job. This gave the foreman a greater feeling of responsibility for each tool that started in the conex box. As the job progressed a foreman could use the ShareMyToolbox app to search for any additional shared tools that were needed. In the app the foreman can request a tool from the central tool inventory or from another job site. The tool manager handles teh delivery of the tools between jobs as well as from the central warehouse and completes each “transfer” inside the app. The foreman then “accepts” each tool delivered to the site which maintains that feeling of responsibility for tools throughout the job. At the end of the job the foreman will review the contents of the conex box with the owners to ensure that everything on the app’s list is in the box. This simple process is helping everyone in the company know who is responsible for every tool. One surprising benefit was the increase in productivity that has been experienced in the field. Quickly after implementing the system the foreman reported that they liked that the system was saving them time. After digging in on the comments Mike found that the indirect labor time associated with tool management was being reduced. Foreman were saving time not driving to pick up tools as the tool manager was able to more efficiently get them from job site to job site. The elimination of paperwork associated with signing tools in and out was a great savings. Most importantly, hours a week were saved by foreman not having to call multiple people to find a tool they needed. They could simply pull out their phone and do a quick search in the app. This allowed them to find the closest tool, quickly request it, and get back to work. Tool tracking has helped MAC Contracting reduce tool costs as they had hoped. However, the bigger savings has been shifting labor time from indirect tasks of finding tools to more direct tasks of completing the work. If you’d like to learn more about ShareMyToolbox, visit https://www.sharemytoolbox.com or call, 866.768.8665.